The craze of social media is all around. People are going crazy with the use of several social networking sites like Facebook. It is seen that the likeness of using this platform for social networking has reached up to a very high level. People have started engaging their personal relationships through it as well. Unfortunately, it has entered in the personal lives of people to such great extent that close relations are facing challenges because of it. 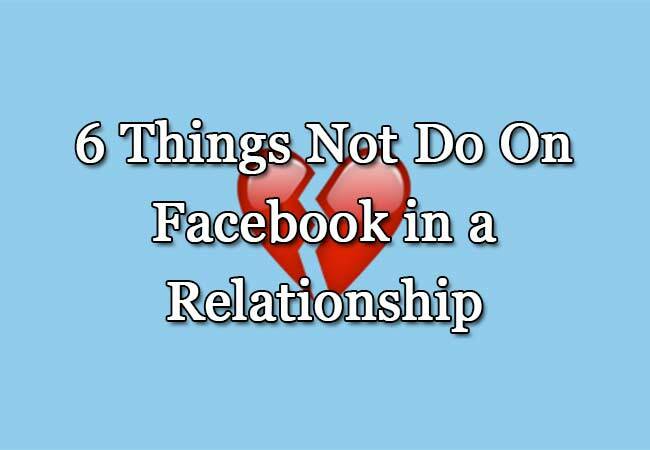 Today you will come to know about all those things, which you should not do on Facebook when you are in a relationship. Whatever you talk with your partner, should be in between two of you. No one else should know what is going on between you two. People will try to harm your peaceful relationship, as mostly people don’t feel happy in your happiness. In case you are feeling to express your love for your partner, then it should in private. The more your relationship will remain private, then more it is going to get stronger. In this way, you are not going to let anyone interfere in your personal life. If you have any problem with your partner, talk to him/her in personal. Nobody else is going to feel your problem. Therefore, putting up a status on Facebook is just going to bring harm to your relation. If you feel like going out for a dinner or want to go out shopping, then you can say it directly to your love. Putting up a status and letting all your friends know about it, is not a sensible act. You are just going to make fun of yourself in front of others. Making your love feel jealous because of any issue by praising others should be a big No. it is going to damage your relationship badly. Try to show your relationship to others as a dignified one. If you had a fight with your partner, then never put up a status in order to tell others as well. People are going to enjoy your problem rather than trying to solve it.